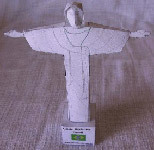 This is a paper miniature of the Christ the Redeemer Statue, that is located in Rio de Janeiro - Brazil. Christ the Redeemer was named one of the New Seven Wonders of the World. Check the instructions before assembling. Click to download the cristo.PDF file (89 Kb). If you don't have Acrobat Reader, download it from Adobe site.